Carte de l'Égypte et de la Palestine jusqu'au temps de Moise Limites du Royaume de David et de Salomon. 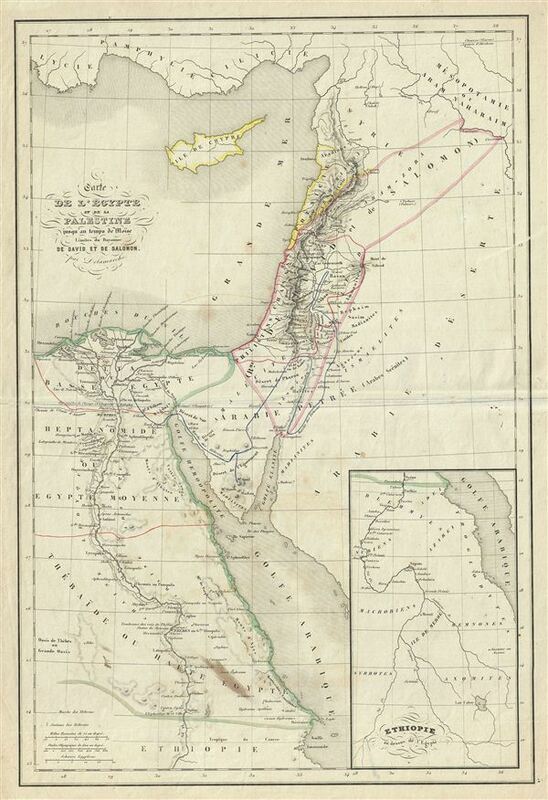 This is a beautiful example of Alexandre Delamarche's 1850 map of egypt and Israel, Palestine or Holy Land from the time of the Biblical Moses to the reigns of David and Solomon. It covers from egypt to modern day Syria and includes the island of Cyprus. An inset in the bottom right quadrant details ethiopia. The map outlines the extent of the Kingdoms of David and Solomon. Both ancient and contemporary place names are noted. Throughout, the map identifies various cities, towns, rivers, mountain passes and an assortment of additional topographical details. Political and regional borders are highlighted in outline color. This map was issued by Delamarche as plate no. 5 in his Atlas Delamarche Geographie Modern. Very good. Some wear on original centerfold. Blank on verso. Minor ink stain near southern Egypt.